The super group DJ Hayai, are emerging into the electronic scene with an upbeat and dynamic sound. You might have known them as dj s0undc10ud, but for expanding into other countries, like Japan, it was time for a change in name. With music that is produced by two unique individuals, Lachlan and Lizzy, this Australian/American duo will still retain its hyper house and bro-step style and energy. Remixes like "NEO BETTER" a Vindata and Mija rework of "Better" and a remix of Melanie Martinez's "Soap," DJ Hayai explodes your inner rave soul with bubbling bass and shredding beats. Below check out the interview with DJ Hayai and explore the inspiration and story behind their rising music career! Question 1: What got you guys into making music? From Seattle, Washington, this blissful producer, Brandon Densley, aka DNZ, brings you music that soothes the soul. DNZ, founder of Fanservice Collective and apart of Northern Natives, can inspire anyone through his minimal yet beautiful music he creates. From producing mesmerizing ambient tracks like "Lost" and "Uncertainty" to soft hip-hop jazz tracks like "Winter Loops," DNZ has a collection of wonderful works within his SoundCloud case. He has even premiered music through the popular music sharing channel, MrSuicideSheep. DNZ is an artist who is not afraid to display total emotion and vulnerability in not only his music but his photography as well. Below I had the opportunity to ask DNZ a few questions around his inspiration and music. Hope you enjoy! Catch DNZ Friday, August 26th preform at the AMPLYFi for Fanservice's LA show! Details here! If you want to listen to something that is light and simple, but fun and quirky, skintrest has the song for you! This 3 minute track even represents what you think friendship sounds like! From Leeds, UK, "Friends" will make you smile and appreciate the small things in music creation. Being skintrest's fifth release from SoundCloud, this sweet tune is the perfect addition to his beautiful music portfolio! Below take a listen to skintrest's "Friends" and enjoy the bubbly beat it has to offer! 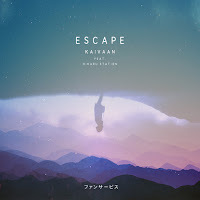 From New York, Kaivaan, artist of Fanserivce Collective, released a dance-pop track with Hikaru Stationtitled, “Escape,” that locks in your attention. This future breakbeat original was released via Fanservice, as a part of their Volume 3 compilation. Not only does this song ooze undeniable joy and exhilaration with encouraging lyrics but the lovely and moving vocals of Hikaru just make the track all the better! With a song like this, Kaivaan is an artist you can count on for music that will make your heart race with positive energy. Below, check out the Artist Q&A with Kaivaan all about the inspiration and creation of “Escape.” Enjoy! Also! On Friday, August 26th catch Kaivaan play for the Fanservice LA show at the AMPLYFi! Tickets here and RSVP here. 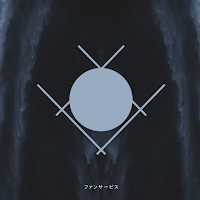 What brought you and Hikaru Station together to collaborate on "Escape"? Drainpuppet obtains a sound unlike any other. Always trying to branch out, this unique producer constructed a new track titled, "Solomon," that brings out the peculiar music style she offers. Via Deskpop music label, Drainpuppet's new track makes you sway back and forth, almost as if the song where transporting your mind to her dimension of musical imagination. Drainpuppet's style of music is boundary pushing and experimental in all elements of the electronic music spectrum. 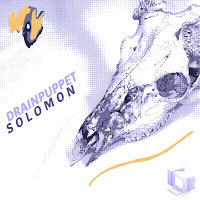 Not only is "Solomon" a solid track but it's also the perfect initial release to derive from her upcoming EP, Firewater! Below check out the Q&A I had with Drainpuppet, talking all about the new single and upcoming EP! Enjoy! Also, check out the mind bending music video for "Solomon"! What was the inspiration behind your new track “Solomon”? 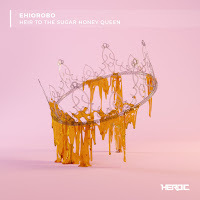 "HEIR TO THE SUGAR HONEY QUEEN"
If the title of this song isn't sweet enough, Ehiorobo will glide his voice into your soul with his track "Heir to the Sugar Honey Queen." Being a re-mastered release, via Heroic Recordings, the light keyboard notes, catchy drums, various samples of popping noises scattered in place, and narrative lyrics about finding love, this stunning artist is someone who you do not want to sleep on. His style is truly eclectic and undefinable. 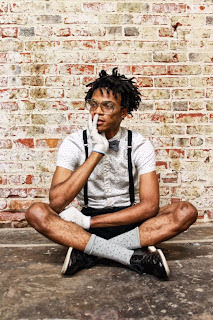 Below I had the chance to ask Ehiorobo about his fresh song, "Heir to the Sugar Honey Queen." Enjoy! Check out and download Ehiorobo's "Heir to the Sugar Honey Queen" here! What was the inspiration behind the track, "Heir to The Sugar Honey Queen"? With the release of their new compilation, Fanservice Volume 2, Fanservice will be putting on their first LA show Friday, August 26th. Taking place at Hollywood's AMPLYFi music venue, located on Melrose Ave, this SoundCloud collective is hosting a show you and your friends will not want out miss out on! 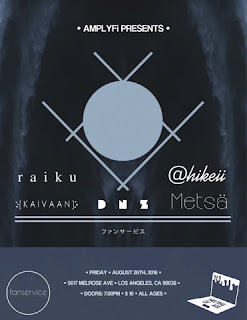 With both DJ and live sets, this lineup consists of diverse electronic artists such as Keii, Metsä, Raiku, and many more! Being our 3rd show of the summer, Melting of Age is happy to announce that the team will be covering Fanservice's very first LA event and we hope to see you there! Below check out all the event and ticketing details. Buy Tickets HERE and RSVP HERE! How do you describe bliss when you hear it? Bohkeh's casually captivating music merges sweet sounds and inducing vocals that show his youthful artistry in all his tunes. From Los Angeles, California, Bohkeh is doing nothing but thriving in a city where music flourishes and expands. With almost 9,000 followers on SoundCloud, this young producer has dropped two successful EPs, multiple remixes, and singles that are catching the ears of many. Tracks like "Tell Me What" featuring Osmoji and his remix of Mark Redito's "Goodbye" display a chill, almost sugary, sound that he offers. With many projects in store, I had the chance to interview the talented Bohkeh! 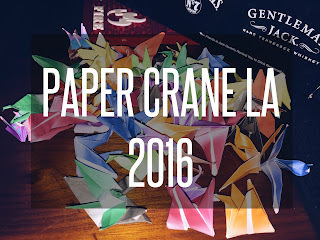 Check it out below and hope you enjoy!